I wish I could have hung on to the Chloe Kim snowboarding victory and let it last the entire two weeks. This was supposed to be an Asian American Winter Olympics in Asia, especially the way NBC was pushing both Kim and men’s figure skater Nathan Chen. We know about the Asian American Olympians of the past from Kristi Yamaguchi and Michelle Kwan. Asian American women are hell on blades. But would these be the games where Nathan Chen creates a new Asian American male stereotype? Would we be transported from the one-inch punching Bruce Lee to the new King of Quads in a Vera Wang costume (one that doesn’t malfunction)? Perhaps in 2022. Not quite this time. After Kim’s scintillating snowboard run that lasted less than a minute, Chen took the spotlight and stumbled in the team competition. He helped to win Bronze there, but that was well short of the goal. The graceless tumbling continued for the women skaters. Though Mirai Nagasu nailed an historic opening triple axel and was lauded in the team skate, she struggled in the individual skates along with teammate Karen Chen and bottomed out the top ten. Nathan Chen tried to rally with a tremendous quad performance in his individual long skate, but it wasn’t enough to medal. After Kim’s smashing start, we only had the ice dancing Shibutanis’ Bronze in ice dancing to cheer. And what a coincidence: Alex and Maia medaled and took their star turn around the same time as the 76th anniversary of Executive Order 9066. Asian Americans of Japanese descent weren’t foreigners then or now. 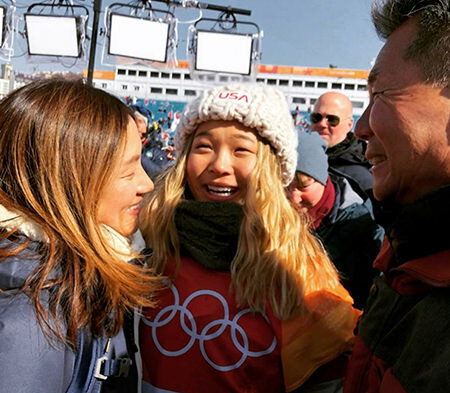 At these games, here were the #ShibSibs representing all of America. Of course, they were third best at these games. But with the America-centric coverage, it was hard to tell. 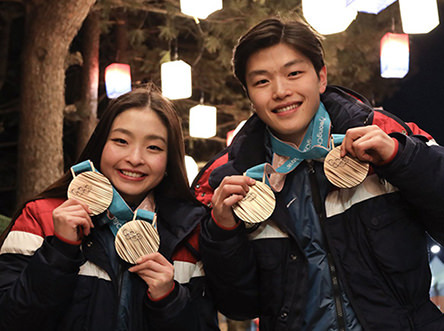 The ShibSibs tended to get more air time on NBC than the Gold medalists Virtue and Moir of Canada. (But hey, they have better health care; they will survive). But I found how you really couldn’t tell a person’s nationality or ethnicity at these games without a score card, passport, or blood test. That’s for certain when it came to drugs. The official name for Putin’s team was The Olympic Athletes of Russia. I added an N.O.D., for “Not on Drugs.” It was quite a statement at the games–especially when a Russian curler was disqualified for testing positive during the competition itself. American Filipinos Asa Miller, a 17-year-old skier from Oregon, downhill skied for the Philippines team and finished 70th. His teammate was Los Angeles-based Michael Christian Martinez, who finished 28th in the men’s individual figure skating competition. The loosened rules, especially those allowing dual citizens through birth and immigration to compete, were actually a refreshing thing about these games. Americans competing on other countries’ teams? You mean like Trump not acting on Russian meddling in our elections as if he’s on Team Russia? For me, it’s these little things that will mark the 2018 Olympic games. Images of VP Mike Pence in close proximity to the sister of Kim Jong Un. The North Korean cheerleading squad. And the combined Korean team playing on the same hockey team. It was just a clinker. More than a display of ignorance. It was an insistence on the wrong pronunciation. An act of defiance. The Business Journal‘s Ben Fisher asked NBC, which essentially showed how much it cared about accuracy. And that gold of Chloe Kim’s wasn’t yellow.